Nearly at death’s door after two bad losses to Texas, Mariners beat Verlander, Cole, Morton and Keuchel to stun the world champs at their home. Palms to foreheads, all. After the 4-3 win in 10 innings Sunday (box), with heroes by the boxcar, count me among the unwashed. The rational mind reels. To beat consecutively Astros starting pitchers Justin Verlander, Gerrit Cole, Charlie Morton and Dallas Keuchel is absurd — the first three were All-Stars this season, the first time in club history the Mariners have whipped in a row such premier foes (h/t Stats LLC). Yet nearly as preposterous was Seattle starter Erasmo Ramirez coming in from the moon to pitch a three-hit shutout over five innings. It was his first start since April 27. Then to let slip a 2-0 lead, but come from down 3-2 to tie with a ninth-inning, two-out, two-strike solo homer by 1B Ryon Healy, followed by a 10th-inning double from RF Mitch Haniger (his fifth in the series) to score pinch-hitter Dee Gordon . . . it’s close to a full Disney. It’s true that the Astros have a Gilbraltar-sized grain of salt this week to offer as a rationale for an eighth consecutive loss at home: 2B Jose Altuve, OF George Springer, C Brian McCann and OF Jake Marisnick are all on the disabled list, as is relief pitcher Lance McCullers. But health travail is merely the turn of the Astros in the personnel blender, and not the responsibility of the Mariners. Edwin Diaz, who joined the absurdity party by saddling up on a scheduled off-day in order to pitch the 10th inning and secure a save for the fourth time in the series and 46th for the season, made the greater point. By scores of 8-6, 5-2, 3-2 and 4-3, the Astros shall know them. The Mariners in Houston were almost unrecognizable from the despondent outfit that had just lost 11-4 and 11-7 to the mediocre Rangers. Seattle played so poorly that it was legitimate to question whether the first-half season of success was a fraud. Capping the morose mood was the demotion Thursday night of Hernandez to the bullpen after he gave up a career-high-tying 11 runs in six innings Tuesday. 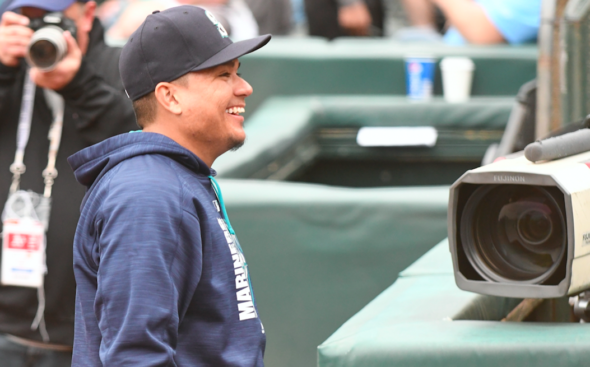 It didn’t help that manager Scott Servais, worried about over-use of the bullpen, left Hernandez in the game despite his obvious inability to finish pitches and innings. The demotion, while the least-bad option, hurt everyone around the club because of the stature and regard in which Hernandez was held. The move is a gamble because no one knows whether Hernandez can make the emotional and physical adjustments to a position he’s never tried in 14 mostly stellar major league seasons. Sunday, Servais twice called to have Hernandez warm up, but elected to follow Ramirez with Adam Warren, James Pazos, Nick Vincent, Zach Duke and Diaz. Pazos and Vincent combined to give up all the Astros’ runs in the eighth. “You gotta find the right spots to use him,” Servais said. “I don’t anticipate bringing him in the middle of an inning. We’ve got to give him time to warm up and make sure he’s loose and ready to go into a game. Wretched as the move felt Thursday, Ramirez, who was inconsistent in his rehab starts in the minors, came through so well Sunday that the club has at least the hope of tamping down the latest personnel drama. By Friday, when he met with reporters, Hernandez seemed to be coming around to his new role. “I had a good conversation with my wife, my family, my agent. I’m finally right up in here,” he said, tapping his head. “I’m going to do whatever is possible to help this team. The 69-50 Mariners’ sixth win in eight games cut their AL West deficit in half (standings), to four games, and to 1½ behind second-place Oakland (70-48), where they traveled Sunday night for three games starting Monday of no small import. At this juncture of the season, filled with high highs and low lows, it is plausible that the Mariners could be swept by the Athletics. Just as easily, they could slap down the A’s. Which makes the series more compelling between the teams than any since 2001, when both won more than 100 games. If one of the games includes a win in relief by Hernandez, consider taking medication that prevents eye-rolling. There’s six regular-season weeks left, which is way too much threat to cause optic-nerve damage. Way too optimistic for you. I’m impressed they actually took Felix out of the rotation and made a move at the top of the lineup. Its difficult to dump the decades of defaulting to doom and disappointment. Go to the Oakland Coliseum. On my own dime. Art, if you’re going to be in town, I’ll buy you a beer. Possibly two. Wish I could take you up on that. Make sure to put on your haz-mat gear before entering the premises. I was at the Coliseum twice last year. Stay home. Watch it on TV. Wear your teal Brian Holman jersey. Alas, no Holman jersey. But I will be wearing my 1977 edition of the wrong-way trident cap. Hey, it’s trendy in Seattle again. Walk down the street wearing one — chick magnet. In February, in the face of 41 years of history (and the pre-history of the Seattle Pilots), I became the self-appointed 2018 Mariner Optimist. At no time, especially in the past three weeks, have I wavered in my optimism. OK, that’s a lie. Your honesty is encouraging. The whipsaws this season have been remarkable, so I have no idea what might happen in Oakland. From a previous thread….I like Mike Blowers. But, on Saturday I counted how many times he said “miles an hour.” Around the seventh or eighth inning I stopped counting. I was at 51. Next time I see him, I’ll suggest he switch to kilometers. Thanks for passing that on. Remarkable. Astute analysis Art. I truly expected the Mariners to tank in Houston and was quickly directing my mind toward more pleasant topics (like the Seahawks), something I’m accustomed to doing usually by Memorial Day. I’m still not able to get my mind around what just happened. Truly it is beyond ballfan comprehension. I’ll bet Servais and Dipoto didn’t see it coming either. Gobsmacked. See also dumbstruck, thunderstruck, agog. Yes, it is. Like church, we are encouraged to have hope and faith, irrational as they may be. And like church, we don’t talk about football… he said, looking sternly over the tops of his glasses. Mariners burned through all their religion for the century in 2001. Think of this as 99 years in purgatory. I just had a flashback of Mother Josephine (in full habit) at St. Bernadette School in Burien. Thanks a lot. Welp. . after witnessing the 4 game sweep of the Astro’s, two sound bites come to mind from a couple of coaches. . though they coached football. .the first is from Vince Lombardi -“What the Hell is goin on out there!??! !” and the other would be with regards to Mariners starting pitching – Dennis Green -“Now if you wanna crown their a$$ then crown there a$$ but they are who we thought they were!!! !” . . What’s next?. . I have no clue. Don’t look at me for help. My shoulders and palms are in the upright and locked position.